In early March Speaker Pelosi bowed to her radical wing of the Democrat Party. Instead of passing a resolution to condemn Democrat anti-Semite Ilhan Omar, the Democrat leader rewrote the party’s resolution to omit Omar’s name. The final resolution was not specific and condemned bigotry and prejudice of all kinds. Speaker Pelosi also allowed anti-Semitic Rep. Ilhan Omar to review and edit the Democrat resolution before it is voted on. It was another shameful moment in Democrat politics. But that does not stop Democrats from attacking President Trump and comparing him to Nazis and Hitler. On Wednesday top Democrat James Clyburn compared President Trump to the rise of Hitler. 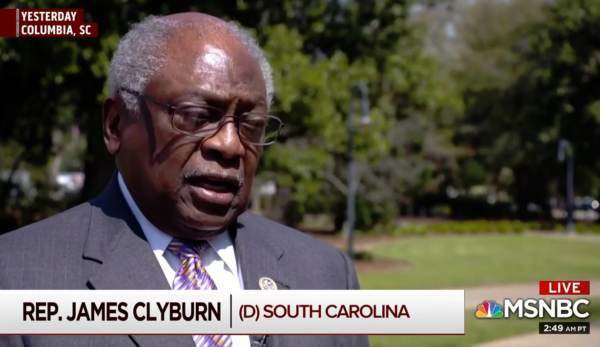 Clyburn won’t condemn Ilhan Omar but compares Trump to Hitler. The post Two Weeks After Democrats Refuse to Condemn Anti-Semite Ilhan Omar – Top Democrat Clyburn Compares Trump to Rise of Hitler (VIDEO) appeared first on The Gateway Pundit.